I’ve recently jumped back into the dating game. Ok, not really recently, within the last year. But being that I’m not much of a cook, I have to be pretty comfortable with someone before I will cook for them. In fact at 35 years of age, I have never even cooked for my parents. Yeah, that pretty much describes my anxiety towards cooking for others. Luckily, being a fashion blogger, my strong suit is definitely more in the design and style of cooking dinner. So while I may not be Rachel Ray, I can Martha Stewart my way around presenting a beautiful meal. In fact, what I’ve learned recently is that it really is in the details. I guess in a way cooking is kind of that way too, adding the right spices, the right taste, and right amount to really give it that little something-something. To get myself psyched up for a lovely dinner date (and to hopefully overcome the nerves of preparing that Mushroom Risotto Correctly) I started with what I am most comfortable with. I found a pretty set of flowers, purchases some new candles and candlesticks and set up the table. (I’m hoping this little show will distract my date from my slightly overcooked dinner) but he is a man after all, so let’s be real. Flowers probably aren’t going to phase him. But it does put me more at ease! What I have noticed about what men notice (besides how little meat shows up in my dinner – Hey! I’m vegetarian!) is that they tend to notice the other things goin’ on around. Like my cat sneaking out of the bathroom where his litter box is. Gee Sebby, thanks for that wonderful timing! So I make sure to make a quick trip to Costco before preparing a meal he will never forget (probably not in the way I want him to remember it!) and load up on the must-haves. I get some Febreze Air effects by Proctor & Gamble in the lovely Spring scent, because in my 9 years as being owned by a couple of cats, I know it’s an absolute must have! It works far better than other air sanitizers I’ve ever used too! It doesn’t just mask that nasty odor but completely eliminates it! I actually have a great set of Karen Neuberger square dishes I love to show off. But If there is one thing I’ve learned from all my years of washing dishes, is that you need a good quality soap to keep the water spots from showing up. I use my trusty Cascade Complete pods which have never failed me. 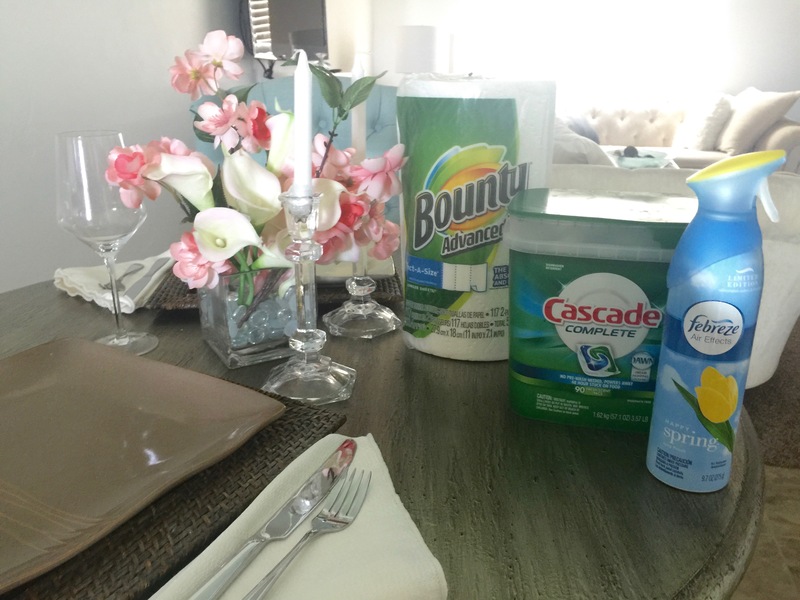 I can skip the pre-rinse too, Cascade is powerful enough to clean even my dirtiest of dishes! And then last but not least, if it’s going to be a good dinner, red wine will most certainly be involved. And while I’m not too worried about him, I know me, and I’m a bit of a spiller. I save my nice white linen napkins for the meal and go straight to my Bounty Advanced paper towels for cleaning up my red wine that has just spilled all over myself and the table. (Oops. I should probably find better ways to relieve the nerves of cooking!) Bounty paper towels are super strong and durable, even when wet! Perfect for that red wine mess! Like the little details of my dinner date and adding a little touch of style and decor here and there, (as well as being prepared for the messes and more) Proctor and Gamble Products and their love of the small little details is what keeps me coming back to their products time and time again. These products work hard so I don’t have to.